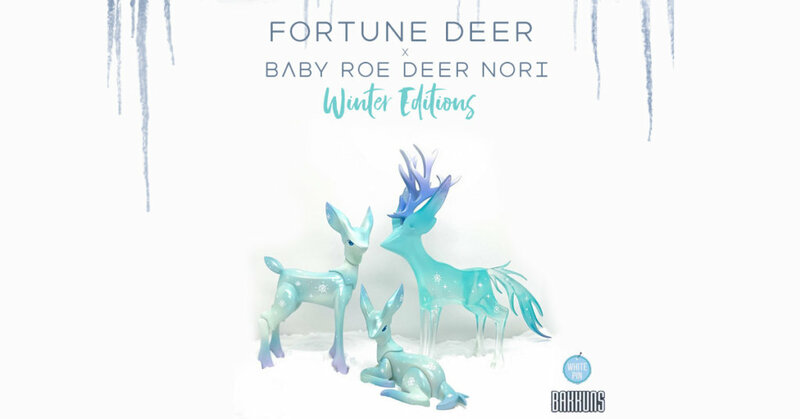 Deep into the Winter months, Sanghyuk Park of BAKKUN, the designer behind one of our favourites art collectables “Fortune Deer” finishes off the year with Winter version of his majestic Fortune Deer x Baby roe deer NORI. We have been in love with Bakkuns designs for the past couple of year (also making it to one of our top picks of 2017) 2018 is the year the great evolution happens! with Sang’s Baby Roe Deer “Nori”, In our opinion right where Fortune Deer left off. Now both having winter look to them and a new pose for Nori they look wonderful together as a pack. Comparing to the Fortune Deer, Baby Roe Deer Nori is as elegant slightly more modern look to it. Has a similar minimalistic free-flowing concept we’ve loved so far. Sanghyuk has se the time and date for the launch! WHEN: Today 24:00 South Korea time. Give Bakkun a follow on Instagram and see all the WIP photo of how Baby Roe Deer Nori was born.